How Can I Automate My Home? A smart home utilises electronic technology to control any number of computerised items within your home. You are probably already using this technology with your automated garage door. Now think about what else would be practical in your home if it were automated. There are a number of processes to automate your home. You can incorporate smart technology in the design of your home prior to the build. You can have a professional smart home designer to create a solution for your existing home. Or, you can use Beacon technology as a cheaper form of automation. Why should I make my house smart? Here are some reasons that can make your time more efficient. Convenience – automate every day tasks such as blinds and curtains. Security – monitor your home from anywhere with connected devices. Comfort – depending on the time of day and weather conditions you can automatically control the lighting and temperature to the climate inside and outside your home. Energy – control when lighting, heating and cooling is used. These are just a number of ways you can make your home more efficient. 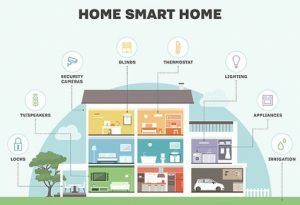 Smart homes – how do they work? The most reliable way to make your home automated is connecting the wiring that talks to your main control device. Sensors, switches and timers will operate automatically depending on the environment within your home. Of course, the main control has to be programmed to suit your mood and objective. Imagine when you enter your home certain lighting is switched on. The heating or cooling engages depending on the temperature. Your security system turns off. But when you go to bed your blinds are closed and your security systems are enabled. All this and more is possible. You can run your home more efficiently and save energy and money. As we know the advancement of technology is never-ending. As soon as a new product hits the market you can be the current provider or their competition is working on how to better that product. Here is a list of providers that are developing ways to make your home smarter and automated.